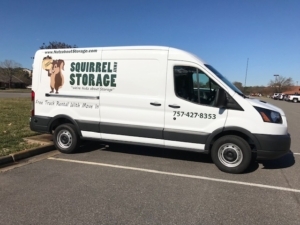 Squirrel Away Storage by Gee’s Group offers the use of a moving van free with new move-in, offer details apply. Squirrel Away is close to the Virginia Beach Central Business District and Virginia Beach Town Center. Climate controlled storage and a van to help me move? What could be better? Look for Sammy the Squirrel and his van at 4720 Baxter Road.